As part of our Project KidSafe campaign, Breakstone, White & Gluck has worked to promote safe cycling across the state of Massachusetts. We have been especially active in the city of Boston, donating our Project KidSafe bicycle helmets to a number of organizations. One of these organizations is Boston Bikes, which is part of the City of Boston’s Transportation Department. 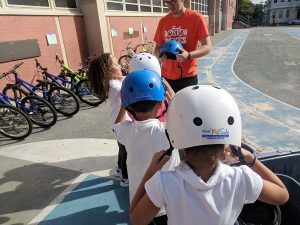 Over the past six years, our attorneys have given roughly 1,200 helmets to Boston Bikes’ programs, including women’s cycling classes, Roll It Forward and youth cycling in city schools. Roll It Forward is a retired program, but it used to fix up used bikes for city residents who needed one. Meanwhile, the youth cycling programs teach safety as soon as children start riding. Thanks to Boston Bikes for sending these photos from the youth cycling programs. Looks like another great year! Breakstone, White & Gluck recently donated bike lights for the Boston Bikes’ #BeBrilliant campaign. 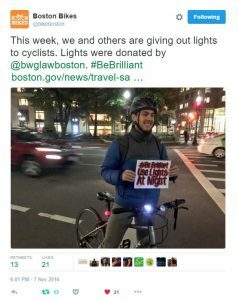 Boston Bikes surprised cyclists during their evening commutes and gave them free bike lights, at various giveaways over several days. A total of 250 light sets were distributed in giveaways in Allston, Dorchester, East Boston, Jamaica Plain, Mattapan, Roslindale and South Boston. Community-based bike shops also distributed lights. In Massachusetts, cyclists are required to equip their bikes with a white front light and a red rear reflector so they are visible to drivers in the dark. 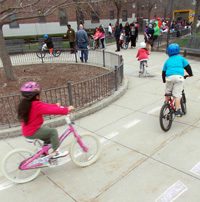 Boston has some hard-working community bike programs which help children and their families learn the rules of safety. We recently supported two of these community groups, Boston Bikes and East Arlington Livable Streets Coalition. Boston Bikes Bike Giveaway in East Boston. 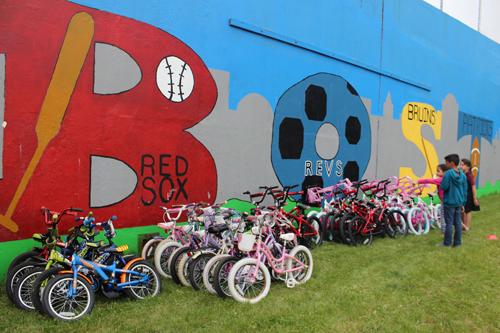 On June 12, the Boston Bikes’ Roll It Forward program gave away 40 bikes to children at the Orient Heights Boston Housing Authority Development. Children ages 5-7 were invited to sign up to receive a bike. 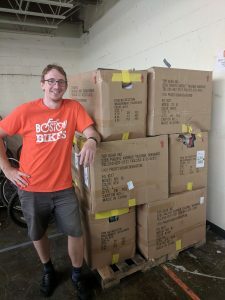 Boston Bikes collects and repairs used bikes to distribute through its Roll It Forward program, which serves Boston residents who do not have access to a bike. Children who participated received a new bike along with a new bike helmet. 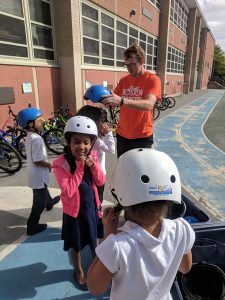 Attorney Sam Segal of Breakstone, White & Gluck helped fit the children for new helmets and spoke to them about the importance of wearing one while riding. 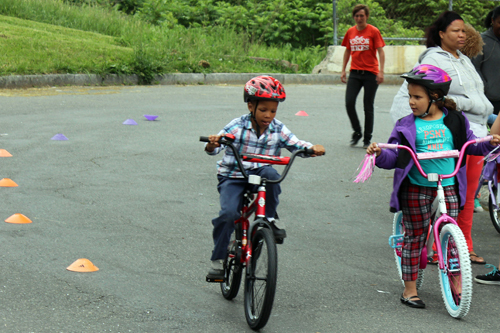 Then, the Boston Bikes staff and volunteers taught the children safe riding techniques. Afterward, each child received a certificate showing they had completed safety training. 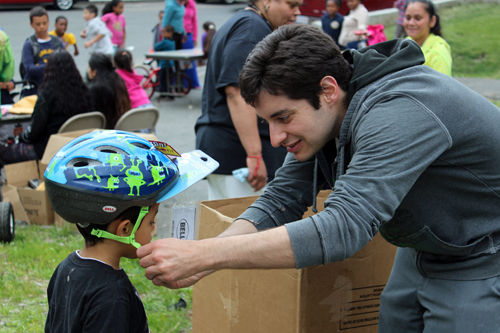 Attorney Sam Segal of Breakstone, White & Gluck helps fit bike helmets at a Boston Bikes event at Orient Heights Boston Housing Authority development. Boston Bikes event at Orient Heights Boston Housing Authority development. Thompson School in East Arlington. 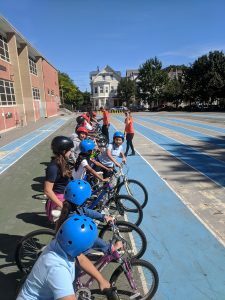 On June 4, the East Arlington Livable Streets Coalition organized a bike safety training for 98 fourth- and-fifth graders at Thompson elementary school. 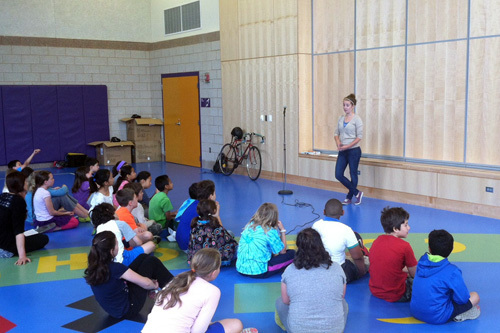 A representative from MassBike spoke to the children about safe riding techniques, proper helmet fitting and bike maintenance. Phil Goff of the East Arlington Livable Streets Coalition also spoke to the children about wearing bike helmets and safety. Breakstone, White & Gluck donated bike helmets to children who showed up without one or needed one that properly fit. East Arlington Livable Streets Coalition event at Thompson School in East Arlington. Learn more about Boston Bikes’ Roll It Forward and East Arlington Livable Streets Coalition. The Boston Bikes’ Roll It Forward program has kicked off another season of important and fun work. On Tuesday, Roll It Forward gave away 59 refurbished bikes to children ages 5-7 who needed one. The donation was part of “Bike Day” at the West Broadway housing development in South Boston and is one of many Boston Bikes will organize this year. Children at the housing development were asked in advance if they wanted to receive a bike. On Tuesday, they waited in line, got to choose a new bike helmet, and then were presented with a bicycle refurbished just for them. They also got to meet Boston Mayor Martin Walsh, who helped hand out bikes and played basketball with the kids. From there, the children got to practice on an obstacle course with help from volunteers, as their parents, grandparents and friends cheered them along. There was plenty of activity for other cyclists too. Boston Bikes was selling $5 subsidized memberships for the Hubway bike share program and provided free safety inspections for 31 cyclists. Another 10 residents used the event to give back, by donating their own bikes to help Roll It Forward. Attorney David White was recognized for his contributions to Boston’s cycling community at last night’s 6th Annual Boston Bike Update, which was held in the historic Faneuil Hall in Boston. 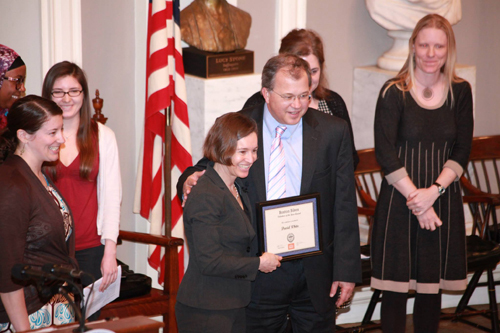 White, an attorney at Breakstone, White & Gluck, received the Volunteer of the Year award from Boston Bikes, the city office which oversees the growth of safety infrastructure, the Hubway bike share facilities, and programs for youth and low-income residents. White was honored alongside Bikes Not Bombs of Jamaica Plain, which received the Organization of the Year award. Jon Ramos was named Rookie Advocate of the Year and Vineet Gupta was Unsung Hero of the Year. Photo credit: LivableStreets/www.livablestreets.info. Attorney David W. White of Breakstone, White & Gluck and Nicole Freedman, Director of Boston Bikes, during the 6th Annual Boston Bike Update at Faneuil Hall. Roll It Forward collects, repairs and distributes bikes to low-income Boston residents who might not otherwise have access to one. The program’s goal is to promote a healthier lifestyle with increased physical activity and fewer trips by car. As of January 2014, the program had distributed 2,728 bicycles. It plans to donate 850 more in 2014. 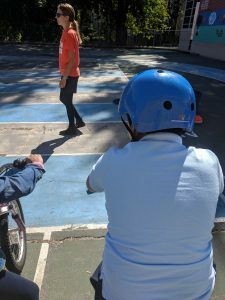 In one very busy two-year period, the city’s youth cycling program gave safety classes to over 7,770 youth. Former Mayor Thomas Menino established Boston Bikes in 2007 by hiring transportation planner and former Olympic cyclist Nicole Freedman. At that time, Boston only had 60 yards of bike lanes and was frequently cited as the worst city in the country for cyclists. Today, the city has 60 miles of bike lanes. Boston Bikes is working to expand the network by adding a variety of new bike lanes, including new cycletracks, which will put a barrier between bike lanes and cars. The Hubway program, which launched in July 2011, continues to grow with more bike stations in Boston as well as Cambridge, Somerville and Brookline. And the program strongly encourages use of helmets, by asking riders to agree to wear helmets in the Hubway contracts, partnering with businesses to offer subsidized helmets and opening the first-in-the-nation helmet vending machine in Back Bay. Watch the Boston Bike Update. Read more about Boston Bikes. View Facebook photos of the 6th Annual Boston Bike Update.